Novinite.com & Novinite.bg Wish You Happy New Year! The Staff of Novinite.com (Sofia News Agency) and Novinite.bg would like to wish a very Happy New Year to you, our readers from all over the world! 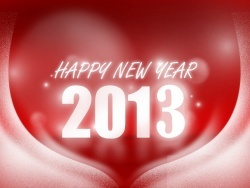 We wish you good health, lots of happiness, and tons of good news in 2013! It is that time of the year again so we we ask you to accept our deepest gratitude for all of your support and interest in our work as we strived to bring to the most important events and developments from Bulgaria and the world in 2012! We extend our warmest welcome all our new readers and subscribers who started following the website of Novinite.com (Sofia News Agency), The Sofia Morning News, and The Sofia Weekly, Novinite.bg, The Novinite Daily – as well as our newest project, yet to come in early 2013 – Novinite.ru! Whether you are in Bulgaria or elsewhere around the globe, stay with us for exciting and in-depth real-time coverage of Bulgarian news and developments and global headlines all throughout 2013! Once again, all the best in 2013!